GL's vHandi™ is a compact portable hand-held FXO simulator (Foreign Exchange Office) that can simulate an analog phone. The vHandi™ call and voice tests can be completely automated or manually performed. The vHandi™ can work with GL’s VQuad™, Voice Quality Test, and WebViewer™applications to perform centralized voice quality measurements and analysis. The FXO port on the vHandi™ connects to an FXS port performing call and traffic simulation. The vHandi™ supports any FXS port including PSTN, ATA or Gateway. The vHandi™ is powered as well as managed via the USB connection. With an internal SD card, vHandi™ can be used as a mass storage device when plugged into the USB port of the PC. 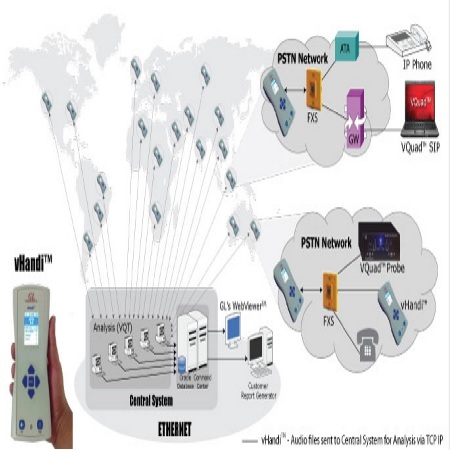 With the Ethernet port, vHandi™ can be connected to the LAN, or directly to the PC for file transfers as depicted in the figure below. Transfer of recorded voice files from the vHandi™ to the remote PC can be completely automated using vHandi™ Listener and scripting.